Ocean View New Construction Has Huge Garage & Entry On Ground Level. Main Floor Has Deck & Open Floorplan Livingrm W/Fireplace--Dining Area--Eat-In Kitchen W/Center Island, Quartz Counters; Bath & Bedroom. 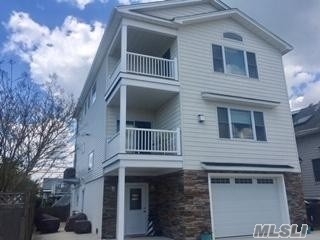 Top Floor Has Oceanview Deck, Master Suite W/Vaulted Ceiling, 3 Closets & Bath; 2Br, Bath, Laundry Rm & Util. Rm. Beautifully Designed & Well-Constructed W/Wide-Plank Wood Floors.